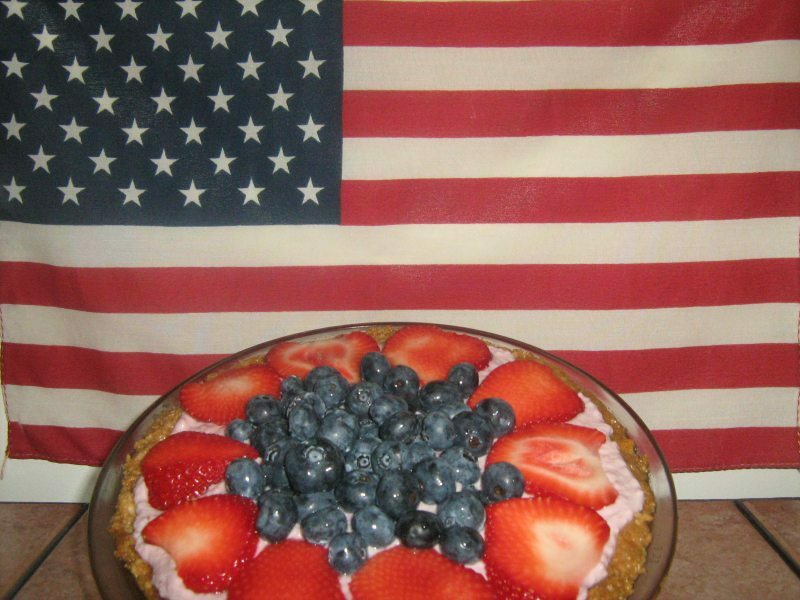 Patriot Pie! Take along this no-bake dessert treat and you'll be the hit of the dinner party, picnic, reunion or wherever you end up! Fruity, creamy not-too sweet...this delicious pie is just right for the slicin'. 1 pkg. (8 oz.) Tofutti brand "Better than Cream Cheese"
Crumble 1 package (9 crackers) of Graham Crackers into powder In a food processor, add the Graham cracker, melted Earth Balance and agave nectar. Process until blended. Scrape the graham cracker mixture into an 8 inch pie plate and press it down to cover the bottom and up a little on the sides. Use the food processor for the filling as well. Put the strawberries in the food processor and process til "pureed". Add the Silken firm tofu and blend with the strawberries. Add the Tofutti Cream Cheese, agave nectar and vanilla. Process intil blended. Add in the guar gum and process to mix into the filling mixture. After the filling has been thoroughly blended add it to the pie plate and spread it to the edges. Top with thinly sliced strawberries and blueberries. Take a picture in front of "Old Glory" (Required).